Whether you have a fabric chair, sofa, fabric in an automobile or draperies, cleaning upholstery is a complicated process that requires training regarding the possible pitfalls you might encounter. When does upholstery need cleaning? Once dirt shows on upholstery, it is already heavily soiled. Regular vacuuming will remove a great deal of the dirt; just make sure your vacuum filter is not clogged so you can extract the most dirt for your efforts. A dirty vacuum filter will not be as effective and you will expend a lot of effort with minimal results. If necessary replace the filter. If you see visible dirt on your upholstery, vacuuming will not likely remove the dirt. You will need to take the cleaning to the next level. These are the pitfalls to watch for when you clean upholstery. Before you apply any cleaning solutions to your upholstery, evaluate to see if you have any of these warning signs. Color loss from prior cleaning or sun fading. Color bleeding from previous cleaning or spills. Sun rot, which will cause the fabric to rip and tear when it is cleaned. Deterioration of the foam in cushions or any markings that could bleed through from cleaning. Loose trim on furniture edges. Rips, tears or frays, especially on the welting. Odor that may become worse when cleaning solutions are added. Stains from oil, perspiration or other substances that need special treatment. Any structural problems or weak joints in furniture. If your fabric is damaged from sun fading, has sun rot or has rips tears or frays, consider having the piece reupholstered or consider replacing. No amount of cleaning will give you satisfactory results. If you have loose trim, structural problems or weak joints get these problems repaired before cleaning. You want to wait until the repairs are completed before you clean so the repairs will not result in new dirty areas on the upholstery. Color bleeding or color loss is common. Many upholstery fabrics are created from various fabric blends that react differently to cleaning. Test your upholstery cleaning solution on a hidden area and allow it to dry so you can see the results. Check the label, synthetics stand up much better to a wet cleaning process while natural fibers like cotton, wool and silk can shrink and bleed when you use a liquid cleaner. If the cushions unzip, take out the insert and check for any labels that might bleed through during cleaning. Remove the label. If you see a pen mark that was used during the manufacturing process, these ink marks and labels can bleed through during cleaning. Put a piece of sturdy tape over the pen mark, if you cannot remove it completely. A pen mark is something that could suddenly bleed through to the outside of the cushion during or after cleaning. If you have stains or odor, consult a professional. If your test spot results showed bleeding or color loss also consult a professional and show them your test spot results. Upholstery cleaning is a complex process that requires special training and the best available cleaning agents. 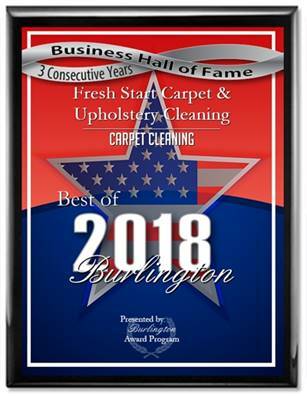 Fresh Start Carpet Cleaning has fully trained professionals who know the pitfalls of upholstery cleaning and can help you get the results you want. If your located in Yardley, Pa you may schedule an appoint via our website.